I love introducing you to authors. I met Chrys Fey through The Insecure Writers Support Group. I hope you enjoy getting to know her and her work as much as I did. Chrys Fey is the author of Hurricane Crimes and 30 Seconds. She is currently working on the sequel to Hurricane Crimes that’ll serve as book two in the Disaster Crimes series. When Fey was six years old, she realized her dream of being a writer by watching her mother pursue publication. At the age of twelve, she started writing her first novel, which flourished into a series she later rewrote at seventeen. Fey lives in Florida where she is waiting for the next hurricane to come her way. You write in several genres, what is your favorite genre to read? I read just about every genre, but I especially love reading the genres that I write – romance, romantic-suspense, and supernatural/paranormal. ’ve been reading a lot of children’s and YA books lately, so the last book I read was A Swiftly Tilting Planet by Madeline L’Engle (A Wrinkle in Time Quartet #3). Did you grow up in a household that encouraged reading, writing or both? Oh yes, I did. My mom would take me and my siblings to the library at least once a week during our summer breaks. I thought of those trips as library sojourns. And she was an aspiring author, too. She wrote many children’s books and read them to us. I would watch her, at the dining room table, writing and illustrating her stories and I knew that was what I wanted to do when I got older. Do you have a designated writing space? A schedule? Any rituals? My desk is in a section of my bedroom. I have a “Wall of Accomplishments” and a “Wall of Inspiration” to motivate me while I write. My one ritual is to listen to music. Music is my muse. As for schedules, I don’t really have one, but in the morning I get all of my blogging and social media done. Then in the afternoon and evening, I try to write. I say “try” because some days just aren’t writing days. In the beginning, I had only published a few flash fiction pieces online and a couple of poems. I was trying to get an agent for the first book in a series, which features Avrianna Heavenborn, the detective in Ghost of Death, when I came to the conclusion that I’d have to break into the publishing world with something else. Enter, Hurricane Crimes. I sent Hurricane Crimes to one small press and got an acceptance. That came after years of no success, though. 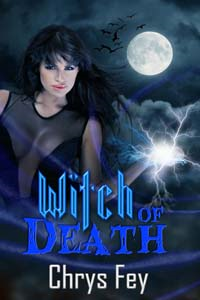 Since then I’ve published a novella (30 Seconds) and two more short stories (Ghost of Death and Witch of Death). Some things happen for a reason…even rejections and setbacks. Coffee, tea, wine or whiskey? Tea. I’m a sucker for hot tea even in the summer…in the heat of Florida. I drink green tea every morning. Chai, chamomile, and lemon-ginger are three of my favorites. Yes, I have four kitties that I rescued as babies. They were born outside my old apartment complex a couple of years ago and were in danger, so I took them in. They are named Cole, Clover, Milo and Otis. Jolie Montgomery, a twenty-one-year-old woman, wakes up in an alley next to her corpse. She has no memories of her murder or the night she died. She didn’t even see the killer’s face before he or she took her life. 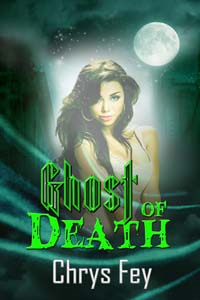 Wanting justice, Jolie seeks answers in the only way a ghost can…by stalking the lead detective on the case. 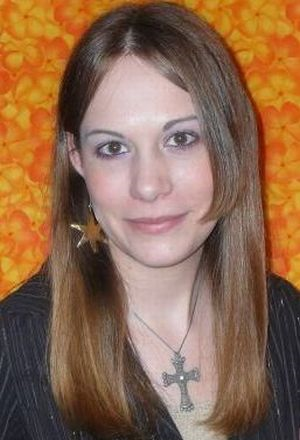 Avrianna Heavenborn is determined to find the person responsible for a young woman’s death. She gets closer to the killer’s identity with every clue she uncovers, and Jolie is with her every step of the way. But if they don’t solve her murder soon, Jolie will be an earth-bound spirit forever. @Lois, I’m glad you enjoyed the interview! And thank you! Great interview! Disasters make pretty exciting material, I enjoyed Chrys’ posts on them during A-Z. I loved those A-Z posts too! I love it when you introduce us to new authors. Nice to meet you Janice! I will look forward to reading your work. Best of luck! What a great interview. Loved learning about Chrys and will definitely be checking out her books now. P.S. I love the idea of a Wall of Accomplishment and a Wall of Inspiration! I love the wall of inspiration and accomplishment idea too. awesome! Nice reading about another writers process. Thank you for sharing and providing inspiration. Tam, thanks for stopping by! Elin, I’m glad to give you an idea. The Insecure Writers Support Group! LOVE that name. Enjoyed this interview. Favorite line? “Music is my muse.” Me too. It is a great group Roz! Wonderful interview and success story. Great interview and I love the idea of having an accomplishment board next to the inspiration board, thank you! Isn’t that such a good idea. Love to see new books and new authors, or at least authors unknown to me! I love reading out of my normal genre and these books fit that bill nicely. I love meeting new authors. Thanks for this interview. What a great success story. I love how you believe in yourself and keep writing no matter what and when! Bravo!!! Great success story and an inspiration to the rest of us! Thank you Carol. She is inspirational! Thank you so much for doing the interview!